Today was a fun day. 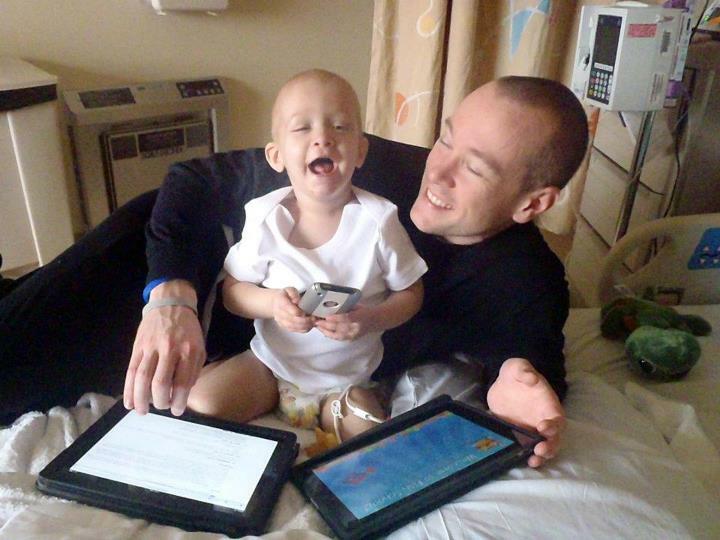 You wouldn’t have known Jackson was here for chemo unless you saw him hooked up to the machine. Jackson woke up this morning in a great mood. He had a decent appetite and we were able to get a little pancakes and juice into him. After he was done, he wanted to play with Ben (his ipad). We just bought him his own older generation ipad and set it up yesterday. So he was pretty excited to play with his own ipad full of kid movies and apps. However, he didn’t want just his ipad, he also wanted Mommy’s ipad and iphone. It was hilarious to watch him operating an ipad on each hand while also looking at a video playing on the iphone. After indulging in a morning of sensory overload he went down for a nap. Jackson’s grand parents came to the hospital for the afternoon and I headed home to get some work done. I got back to the hospital around 5 and Jackson was still in a great mood, running around the floor with Tony chasing after him with his IV pole. Around 8, they took Jackson off of his IV and he was a free man for about an hour. It was the best hour I have had in awhile. Jackson was hilarious, running and dancing around the room to Sesame Street and Tangled music. I haven’t seen him so happy and dancing for a long time. Meredith and I both loved it. Jackson you are an amazing little guy, we love you so much and couldn’t be more proud of you.